My blog purpose is to showcase recipes, photos, humor and the occasional side order of bicycle tales. I realized I have yet to fulfill my mission statement! Mostly I have not bee riding as much as I do and will in the warmer weather. However, by the temperature readings in Philadelphia this past week, I could technically be doing many long distance voy ages on my trusty aluminum steed. Between my work schedules, general laziness and the still dark and short days, I haven't been able to ride much more than back and forth to the office. Hey, I'll take the 4 miles a day - it's better than nothing and saves me at least $5.50 a day. This past Saturday, I got in a ride with my friend, Susan Hill. That's her, as we stared on our ride. She's an avid cyclist and all around high energy and fit lady. Nice cycling partner who doesn't seem to mind my slower ascents up hills and the occasional derailment to stop and take photos. 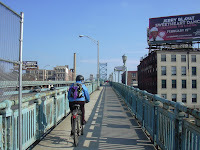 She suggested that we conquer the Benjamin Franklin Bridge, a crossing I've been wanting to try since I started riding more seriously. There are still so many rides and places I've not tried or accomplished even though I have lived in Philadelphia all of my 40 years. Aside from walking across a bridge in Pittsburgh (and really, does that count? ), I don't recall if I have ever gone over a major bridge on foot or two wheels. We can cross that off my life list of 1,000 places and things to do before I die. WHOOHOO! Big Accomplishment! Seriously, it was fun. I don't' know that I would have felt in shape enough prior to the weight loss. Nor would I have felt confident enough to scale such a height. The bike climb up the bridge pedestrian path is gradual enough so I didn't fee winded. The railings on either side of the bridge are high, sturdy and safe. The path is wide enough to accommodate cyclists, joggers and the occasional Rollerblader. 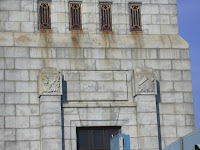 After we crossed the bridge and landed on the Jersey side, we rode around the Camden riverfront, taking in the sights of the Campbell Soup River Sharks Ballpark; Battleship dock; and the New Jersey State Aquarium. Surprisingly, it's quite nice on the Camden side of the Delaware River, at least in these areas. It's clean with open spaces and easy accessiblity. Clearly the Jersey politico's and planners have a better thought out plan for their side of the River than our brethren in Philly. Don't get me started! We passed through the Rutgers Camden Campus, small but safe looking. Found the Walt Whitman House, one of three small row-homes standing alone in an empty lot neighborhood that's going through some major re-gentrification. 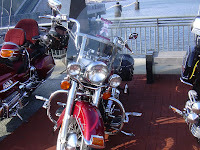 Along the riverfront, we stopped to view a gaggle of motorcycles parked in front of the SS Battleship New Jersey. Members of The Buffalo Soldiers motorcycle club were parked out front of the dock landing. Not sure what of the occasion, the sight of all these gorgeous machines was startling. 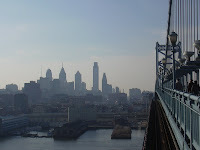 I had a bit of trouble heading back to Philadelphia, I couldn't quite catch my breath going back up the bridge. The climb carrying my bike up the stairs and trying to peddle up a more steep ascent was a bit much for me. Susan left me in the dust, getting a good healthy head start, while I struggled to pedal faster than 5 miles an hour, clear my phlegmy throat and not take a lot of pictures. I stopped twice, and yes, took a few photos along the way just to "document" my journey for posterity! 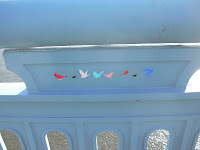 Susan actually noticed these bird decals at the midspan part of the bridge. While I did not get to take nearly as many photos as I wanted, there will be other times to cross the bridge and chances to snap the images and things I missed on this trip. Provided the sun is out and the wind isn't beating me down, I'll be adding this trip to my biking itineraries soon. You have a very cool blog! Here is a cool link I found and it is free, check it out. This is like Google ads but it pays more! If you have a blog or web sites that allows you to edit the script template this is for you. You get paid for every view to your Web sites that you control. You are a great blogger. This is terrific to see and read. It's been so much fun to hang out with you like this. Keep up your great work. I've got to try to make those oatmeal cookies you have posted.